Since 2010, STC has recognized two actors per season who have demonstrated exceptional skill and technique on the stage. Carson Elrod as Crispin disguised as the pig farmer neice in The Heir Apparent, top, and Steven Epp as Truffaldino in The Servant of Two Masters. 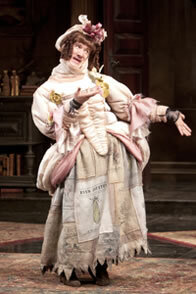 Photos courtesy of the Shakespeare Theatre Company. The Shakespeare Theatre Company (STC) in Washington, D.C., awarded its annual Emery Battis Acting Award to Carson Elrod and Steven Epp. Since 2010, STC has recognized two actors per season who have demonstrated exceptional skill and technique on the stage. Elrod and Epp were lauded for their performances as Crispin in The Heir Apparent and Truffaldino in The Servant of Two Masters, respectively. This award, named in honor of STC’s longtime friend and affiliated artist, the late Emery Battis, is given based on the recommendation of a panel of 11 individuals, which includes theater professionals, local critics, and STC supporters. All performers and shows within STC’s mainstage season are eligible for the award, which comes with a $5,000 cash prize for each awardee, made possible by the support of a generous donor who wishes to remain anonymous. Panelists nominate two actors each year: one emerging performer who has the potential to make extraordinary contributions to the field of classical acting, and one established performer, who has given one of the season’s most impressive performances and whose commitment to not only classical theatre, but also not-for-profit theatre, is unmatched. Carson Elrod made his Shakespeare Theatre Company debut as the cunning young manservant Crispin in The Heir Apparent. Elrod was recently seen in New York Shakespeare in the Park’s Measure for Measure and All’s Well That Ends Well. His Broadway credits include Reckless and Noises Off, and he has numerous New York credits including Peter and the Starcatcher, Based on a Totally True Story, Cavedweller, Waiting for Godot, and Monkey in the Middle. His long list of regional theatre credits includes The Wake, How the Other Half Loves, A Flea in Her Ear, Oliver Twist, The Importance of Being Earnest, and The Merry Wives of Windsor. Television and film audiences will recognize Elrod from his roles on 30 Rock, Law & Order: Criminal Intent, Medium, Wedding Crashers, Married to the Kellys, and Kissing Jessica Stein. 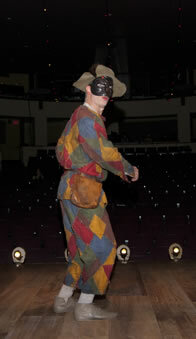 Steven Epp performed the role of Truffaldino, the crafty servant in STC’s production of The Servant of Two Masters. Epp was the co-Artistic Director at Theatre de la Jeune Lune, winner of the 2005 Tony Award for Outstanding Regional Theatre, from 1983–2008. While there, he performed the title roles in Tartuffe, Crusoe, Hamlet, Gulliver: A Swift Journey, and many others. Other theater credits include performances at Yale Repertory Theatre, the Guthrie Theater, La Jolla Playhouse, Berkeley Repertory Theatre, Trinity Repertory Company, Spoleto Festival, American Repertory Theatre, Actors Theatre of Louisville, Alley Theatre, and Off-Broadway’s New Victory Theater. He was a 1999 Fox Fellow and a 2009 McKnight Theatre Artist Fellow.